The growth in temporary help supply (THS) employees is one aspect of the recent general trend toward flexible, market-based work arrangements. Such employees are on the payroll of temporary help agencies but they actually work in other sectors of the economy, e.g., manufacturing. There are several reasons for the growth in such flexible work arrangements. First, by reducing the cost and risk of hiring, temporary agencies allow firms to provide employment for entry-level or low-skill workers. These workers often lack the skills or experience firms expect from their permanent workforce. They also benefit from using agencies because by doing so they present less risk and are more likely to be hired. Many of the THS workers eventually gain new skills and transition into permanent jobs with the client firm or elsewhere. Second, temporary help arrangements enhance productivity. This occurs as firms realize economies of scale through specialization of labor in particular tasks and benefit from the temporary help agencies' screening and matching of workers to jobs. These productivity enhancements also benefit workers through higher wages and a better accommodation to the needs of some workers for flexible work commitments. Third, firms gain by using THS workers to adjust more rapidly and aggressively to temporary or uncertain changes in demand. In parallel, workers gain from having more opportunities available in periods of temporary or uncertain demand. The THS industry has become increasingly controversial, as it has come under attack from organized labor, which claims exploitation of temporary workers. However, such claims ignore the economic benefits from the flexible arrangements to both firms and workers, particularly workers who need a bridge to permanent employment. A number of studies have documented the increase in the number of employees holding jobs through temporary help agencies. However, data problems have prevented reliable measurement of the number and characteristics of temporary workers. Accurately measuring the number of such workers is important not only to know the incidence of such arrangements, but also to accurately track labor inputs, and thus productivity, in particular sectors. 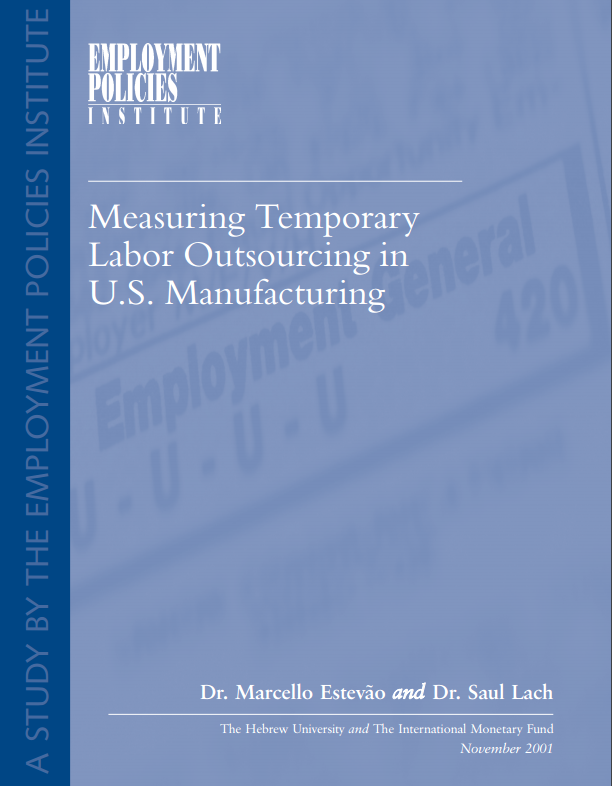 Dr. Marcello Estevão of the European Division of the International Monetary Fund† and Professor Saul Lach of Hebrew University have broken new methodological ground to provide the best estimates to date of the use of temporary employees in U.S. manufacturing. By using pioneering statistical methods and combining information from a variety of independent sources, they derive several time series estimates of the number of temporary workers employed in the manufacturing sector. Their estimates confirm that manufacturing firms use temporary help agency workers as an adjustment to sudden economic shocks. For example, they find that as a response to the economic slow-down in the late 1980s and early 1990s THS employment in manufacturing declined, only to rebound during the recovery in 1992. They observed a similar pattern during the recession at the beginning of the 1980s. The economists conclude that the THS industry facilitated rapid changes in the level of manufacturing employment in firms that in the absence of the THS alternative would not have hired so aggressively. This is new evidence that temporary help employment has been responsible for improving the work experience of the American labor force. Those particularly benefiting are likely to be new labor force entrants, workers displaced from jobs, and those who prefer flexible work arrangements. Temporary help workers are on the payroll of a temporary help agency, not the firm actually using their labor. Consequently, the Bureau of Labor Statistics (BLS) establishment surveys do not assign them to the industry in which they actually work. Thus, the BLS time series counts of workers and hours supplied to firms in the manufacturing sector understate their true magnitude. The authors combine data from different sources to estimate the number of temporary help workers in manufacturing in each year from 1972 to 1997, and the number of hours they supply from 1982 to 1997. The data sources include: (1) the National Association of Temporary and Staffing Services (now the American Staffing Association) survey of temporary employees; (2) the BLS Current Employment Survey (CES); (3) the Current Population Survey (CPS); and the Contingent Worker Supplements to the CPS (for February 1995 and February 1997); and (4) input-output tables. These data provide snapshots of the temporary help industry from different points of view (e.g., from individuals and also establishments). They also provide information on both the characteristics of workers in the manufacturing sector and the characteristics of workers on the payroll of temporary help agencies. However, none of these data sets taken alone accurately measures the number of temporary workers and hours in the manufacturing sector on a year-to-year basis. The authors compute an annual time series of upper and lower bounds for temporary labor used in manufacturing. Their estimates use information on the characteristics of all workers employed in manufacturing and of all workers employed through temporary help agencies. This allows them to predict how many workers are likely to be in both categories in any year. Because the characteristics do not allow them to discriminate perfectly between workers who will and will not be temporary workers, they can only estimate upper and lower bounds, not exact numbers. They also provide several alternative point estimates of THS employment and hours within their upper and lower bounds. Drs. Estevão and Lach find that the manufacturing sector has been increasing its use of THS labor. Their best estimate is that the number of temporary workers in manufacturing grew from about 34,000 in 1972 to about 707,000 in 1997. They also estimate that the number of hours supplied by these workers grew from about 53 million in 1982 to about 1.3 billion in 1997. According to the authors, the Bureau of Labor Statistics has systematically undercounted the number of temporary help workers employed in manufacturing. By correcting the BLS numbers, Doctors Estevão and Lach show that manufacturing employment has been more cyclically sensitive than previously realized. For example, during the recovery from the 1991 recession, BLS reported employment in manufacturing continued to fall through 1993, and only rebounded in 1994. In contrast, uncounted THS employment in manufacturing increased by over 79,000 from 1991 to 1992 and by about 150,000 from 1992 to 1993. This led the agency to under-estimate employment growth during the recovery and subsequent expansion. While BLS reported an increase of only 570,000 manufacturing jobs over the period 1992-1997, professors Lach and Estevão estimate that manufacturing employment increased by about 1,075,000 over the same period. Temporary help workers accounted for the difference. The authors find that the temporary help industry thus helped to increase employment in manufacturing by allowing firms to expand their labor forces in the face of uncertain demand conditions.